CycleBar, a premium indoor cycling franchise, known to be the world’s only and first “Premium Indoor Cycling™,” offers premium amenities, concierge-level service and a concert-like environment designed to rock your ride. Launched by brother and sister, Bill Pryor and Alex Klemmer, CycleBar is similar to other franchises like Flywheel and SoulCycle. How much does CycleBar cost? The cost of CycleBar classes, from what we could see on the official website, would greatly depend on the package you choose and the location you sign up. As with many gyms and studios setup like this, first-time visitors can often take advantage of an introductory deal, often paying nothing for your first visit to offer you a taste of what the class is really like. For example, at the time of this publishing, first-time customers could sign up for a free 30-minute introductory class. 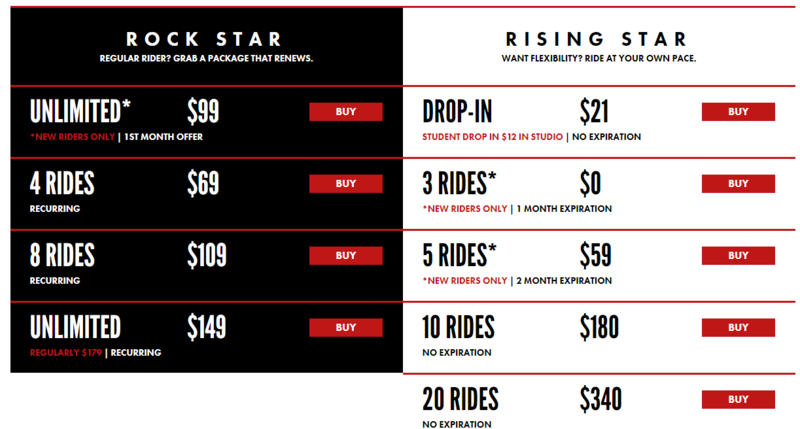 As for other options, the prices ranged anywhere from $18~ per drop-in class to as much as $340+ for a 20-ride pack with no expiration options at some locations. As for recurring plans, four rides could cost as little as $69 a month to as much as $149 a month for unlimited rides. Overall, the more you buy, the more you’re going to save. We took a screenshot from the official website to show you the options we were presented when we browsed at one of the Colorado locations, which you can view below. The costs are greatly going to vary and we highly encourage you to visit the official website and find your studio by using the “zip code” finder in the upper right-hand corner. From there, find a location you want to visit and click the shopping cart icon for pricing information. Business Insider noted the costs could drop down to as little as $12 per class at some locations if you were to purchase classes in bulk. Upon arriving, you will be asked to sign in at the front, with first-time riders asked to sign a waiver by someone who is at least 18 years old. The company will ask that you arrive at least 10 to 15 minutes before you ride if it’s your first time so that the staff can offer you a tour of the studio, help outfit with your shoes, adjust your bike and simply explain how everything works. Every time after, you can register for a ride and select your bike location when you arrive for the class. Classes options vary, from the “Classic” class, which focuses on something for everyone, mixing strength, endurance, challenges, hills, and drills, to the “Connect” class, which transforms the studio into the place to revive and restore by turning off all of the video monitors and tuning into the music. Other options, according to the classes page on the website, includes the “Performance” class, which ups your game to motivate you with the company’s CycleStats technology, to “Themed Rides,’ a class option that creates a party atmosphere, keeping things fresh with a varying schedule posted weekly. Karla Peterson at the San Diego Tribune noted the classes are typically held in studios with club-style sound systems and disco-fever lighting. At the end of each class, the CycleBar location will email your results, which measures the six key metrics during your ride, such as your power, calories, and RPM, after each ride as well as post them privately via cyclebar.com for you to view at any time. At the CycleBar, as per its information page, they take care of everything, meaning you only have to show up, clip in and ride. The company provides complimentary shoes for the ride, snacks and bottled water. If you want to bring your own shoes, they note the bikes are compatible with LOGIK and SPD shoes. Locations also offer coded keypad lockers and lockers rooms equipped with wet clothing bags, hair ties, robes and toiletries. The theater, according to the FAQ is a device-free zone. No calls, social media or texting is allowed. They also ask you to give your full attention, avoiding chatting with your neighbors. Since it can get hot, they do ask you to tone down on the colognes and perfumes. To find a CycleBar location near you, you can use the official search tool here.